I have a feature selection and regression task in which a dataset dataset is provided with 64x3000 numeric data. I want to use the best features for best settings possible for a number of learners (i.e., linear regressor and decision tree). I use mlr package in R. If I understand the provided tutorial correctly, I have to use resampling (terms like inner and outer resampling) . Why is this type of nested resampling required while I am cross-validating the learner and settings during parameter optimization? "RTp_1225"    "L2u_940"     "Mor03m_813"  "TIC3_182"    "Mor03m_2294"
 "H.046_1401"  "Mor21u_2280" "RDF065u_640" "RTp_1225"    "CIC2_1660"
 "RDF065u_640" "RTp_1225"    "L2u_940"     "Mor03m_813"  "TIC3_182"
The purpose of a nested cross-validation is to reduce overfitting -- that is, thinking a model has good generalization performance when it doesn't. To see why this is a problem, consider the extreme case where a model simply memorizes the data (for example KNN with 1 neighbour). If you evaluate this model with the data you've trained it on (or part thereof), you'll get perfect performance, but any other data will probably give terrible results. That's why you need separate train and test sets. But even with that, it's possible that you get an unlucky split and train and test end up being too similar, again giving a misleading impression of the real performance. It could work the other way, too, where the train and test sets are too dissimilar and no matter what you learn on the training set, you won't do well on the test set. So you can go one step further and use a series of train and test sets -- cross-validation. You take your entire data and split into n of folds, using 1 fold for testing and remaining n-1 for training, then another for testing, and so on for n rounds. Why is nested cross-validation for things like tuning (where lots of different models are evaluated and compared) better? Consider the following thought experiment. A learner has one parameter which just adds random noise; there's no real effect. Comparing different parameterizations of this learner will result in one of those being best by pure chance, even when using a cross-validation. In a nested cross-validation, the models will be evaluated on yet another set, showing that the parameter doesn't actually do anything (or at least more likely to show that). Neither cross-validation nor nested cross-validation are really required in any case, but they'll likely improve the generalisation performance of the end result dramatically. Nested cross-validation is a statistical concept of estimating the performance of a statistical (machine learning) model. The outer cross-validation splits the data in train + test and estimates the model performance on each fold. To minimize variance of random partitioning within folds, this is repeated x times. Now you could use the default parameter settings each time you train a model on the training set. However, default settings of a model are likely not optimal for each data set out in the wild. Hence, another cross-validation is performed (= the inner resampling) which has the aim to find the best parameter set of a learner for each fold. 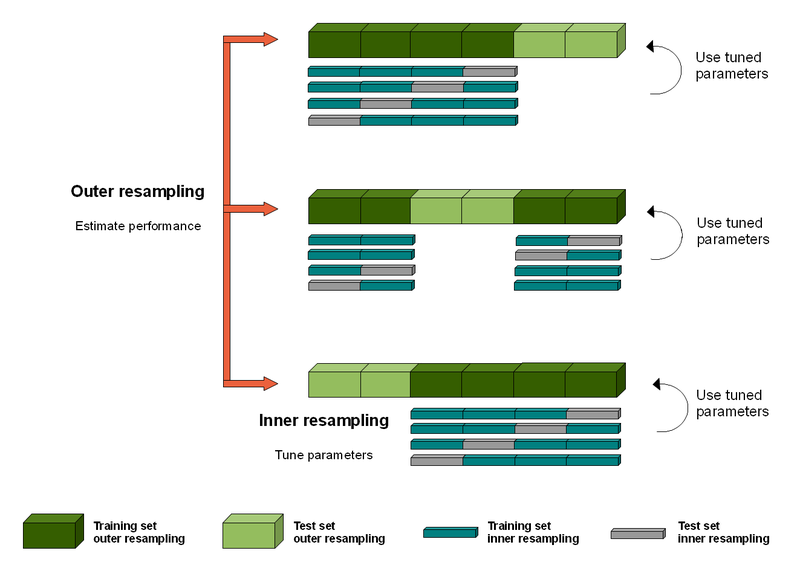 This parameter set is then applied to the actual training set of the outer resampling procedure, assuming that the model achieves better results using this non-standard parameter configuration. This concept of finding the best parameter set is also referred to as "tuning a model". You could do a grid search and try all possible parameter configurations or you do a random search and pick randomly a parameter combination y times and see what comes out. The more random tries, the higher your probability to find the "optimal" configuration. However, it is unlikely that this is found by a random search, especially if you have numeric hyperparameters. Nevertheless, using a several hundred iterations of a random search will most likely find a better configuration than the model default. Be aware that nested cross-validation is computational intense as you are fitting thousands of models (several hundred iterations in inner + ususally 500 - 1000 iterations in outer (folds*reps)). Therefore it is highly recommended to parallelize your code. Here is a full parallelized example which also extracts the tuning results (see extract argument in resample). This works on a binary response task (which is not given here). According to this website: http://mlr-org.github.io/mlr-tutorial/release/html/nested_resampling/index.html the reason why you might want nested resampling is that each hyper-parameter or other component of your algorithm that is tuned according to cross validation should get a separate sample of data. This ensures that the correlation induced by cross validation is not increased in your sample. For example if you use the same sample to tune a sparsity parameter and to estimate the coefficients you might be inducing correlations that you do not want (unless you have a single oracle type procedure which does both sparsity and parameter estimation in one procedure). If you use 2 separate procedures and both require cross validation with one being nested within the other in for loops (as an example) you would assume in your outer loop the data is sampled and then in your inner for loop you would assume the sampled data is given and resample from this (outer for loop's) iteration's sample of data. Not the answer you're looking for? Browse other questions tagged r regression feature-selection resampling or ask your own question.